Thanks for investing the time to crunch these numbers. Assuming you continue to post this each week, is it possible to post the score or rating you are calculating for each school. Will be interesting to that and how it trends week to week. Again, thanks for your work on this. Yes please! I'm curious to see where TAMUK falls in all this now based on the current six game winning streak. 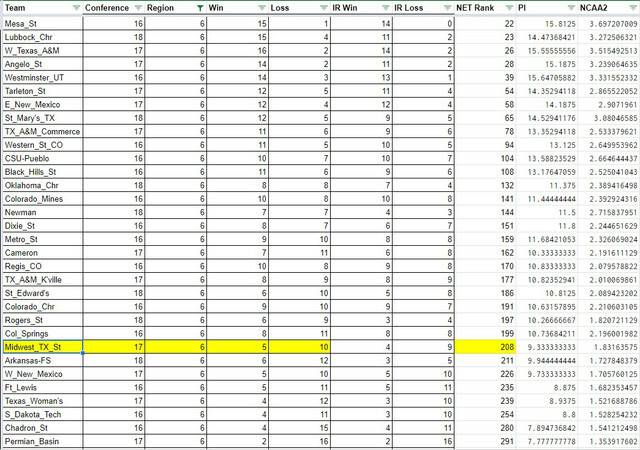 The numbers to the side are the NET formula used by D1 Men for tournament selection. The one thing that has to be factored in is that conference tournament champions receive automatic bids. 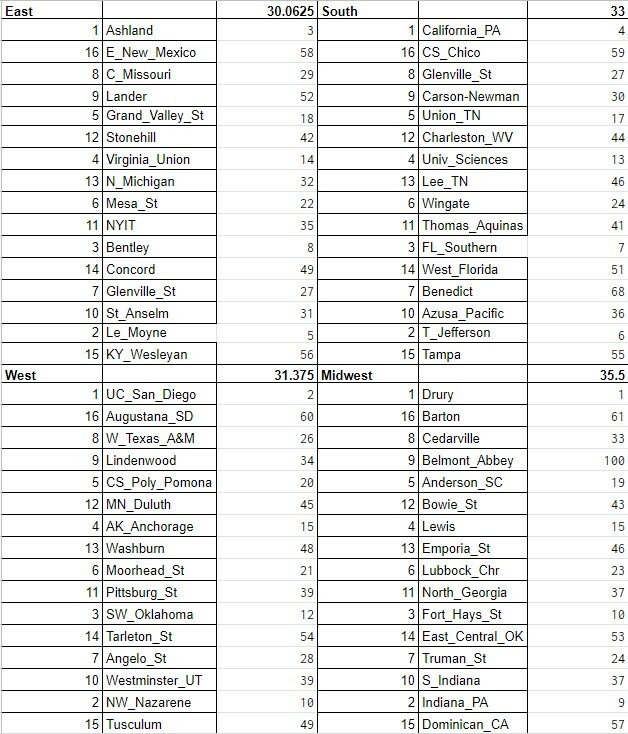 That could theoretically skew things one way or another, but when making pre-conference tourney projections, I always took the team that was in first place at the time if no other conference was in the top 64 (or, in this case, the top eight in a region). Current first place teams were used for this make shift bracket. Why do you have ENMU in the East? Or should that be someone else. Eastern's record is not all that good. This was built as if they were in a D1 tournament setting, once you start getting towards the bottom teams get placed in whatever region is available for the seed they should be. Region no longer matters. Sorry. Didn't understand the premise of the post. Because they have EAST in their name? JKJK just trying to have some fun on a Thursday morning! I just got my bill from the hospital. You guys need to be working instead of piddle parting around on message boards. Why do you have ENMU in it? Or should that be someone else. Eastern is not all that good. And to that i say a merciful 28-0 should have been 35-0.